First and foremost, let me tell you that it takes a lot of organising and hard work to go from a 5 bed home of 16 years habitation, to a 25ft caravan with a little bit of extra room in the tow vehicle, via a 3 bedroom home, with just a few boxes of family keepsakes in storage. A lot more than I imagined anyway. Well, that’s my justification for not updating this blog in recent weeks. We vacated 82 Hawdon St Moruya on 11 November and shifted the caravan et al up to Peter Richardson’s property some 5K north west of Moruya. We spent just over a week there trying to make everything fit. It would be fair to say we are still carrying way too much stuff! Peter’s carpentry skills bought about some good suggestions and we made a few modifications to the layout. Removable catches on the doors to the cupboards have made accessing then so much easier. I also shifted the tracks that locate Suzi as far left as possible, right next to the nearside wall so that I can squeeze past Suzi once it is loaded. Ratchet tie-downs are are breeze to use to restrain Suzi front and back. The weber bbq has a home under the back of Suzi and the 60L Big Chilli 12/24/240V fridge/freezer I got for a bargain on the last day of the Batemans Bay Caravan & Camping expo travels in the back of Suzi, making it easily accessible even when she is loaded in the truck. On a drizzly Tuesday morn we left Mogendoura for Canberra. Towards the top of the Clyde Mountain we were back in second gear but then so are many heavily loaded vehicles. 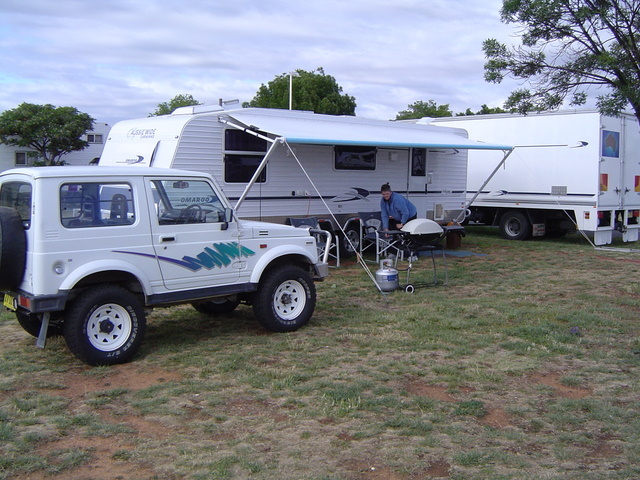 We camped at EPIC, the site of Summernats. They have plenty of room for bigger vehicles and at only $20 per night for a powered site are one of the cheaper sites anywhere. Lots of “carni” types there with their big set-ups, so we were a bit dwarfed by them. Spent time catching up with family – our son Rodney, David’s sister Christine and her family and David’s niece Cherie and her family. It’s been a while since we saw great nephew and niece Nicholas and Caitlin. Caitlin is no longer the shy retiring type she was. Also spent time fine tuning things. Bought a laptop and a prepaid nextG internet access thingie. Pity Telstra registered it as a mobile phone rather than an internet access thingie. Along with Rodney we all wasted over 3 hours at a Telstra shop before they found out why it wouldn’t access the net. I spent 10 years working for Telecom but of late I have developed a huge dislike for the organisation they have become. Pity their powers-that-be didn’t feel the frustration many users have in trying to deal with them. I also bought a Trax 430 navigator, an annex floor mat and a privacy shield to fit the awning. I few small modifications to the van have also been done – eg new catches on some of the cupboards as the supplied ones were impractical. Finally, on Sunday, 23 Nov 2008, we made the decision to hit the road on Tuesday morning. Monday we had lunch and tea with Rodney and let the wet weather pass. So, as of Tuesday 25 November 2008, we have accepted the “grey nomads” tag. We packed up and hit the road by about 9.30am. Towing at about 95kph feels best but we can easily maintain the speed limit also, except on the steeper sections. We had a wander around Young before we hit Gooloogong, between Cowra and Forbes. Hats off to Cowra Council for supplying a free site, with power, water, showers and toilets. Good pub just over the road also. Found the navigator a great help already. Its speedo is a great help in Suzi as with the bigger tyres her speedo is about 10% under her actual speed. The navigator also acccepts co-ordinates and using the Camps book it quickly directed us to our next overnight stop. After a visit to the shops at Dubbo we set up camp at Hickey Falls, a rest area south of Coonabaraban. 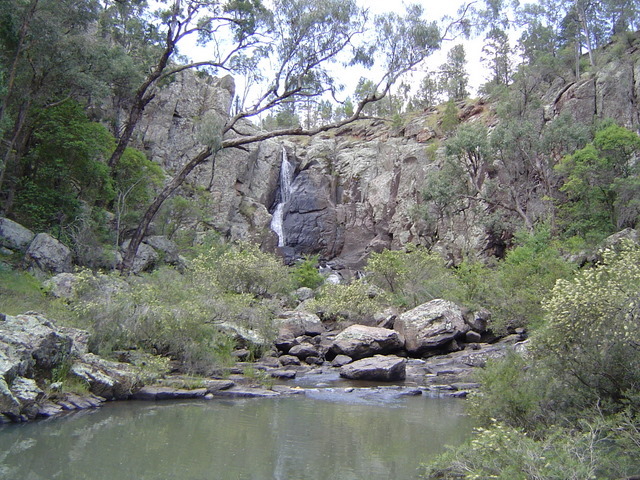 Lovely setting – shady, just 25m walk to the falls and far enough off the road to be not too noisy. We could hear thunder rattling around the nearby hills, but right on beer o’clock when I had climbed up to the back of Suzi to grab a stubby from the beer fridge all hell broke lose. We got pelted by a short sharp hail storm. 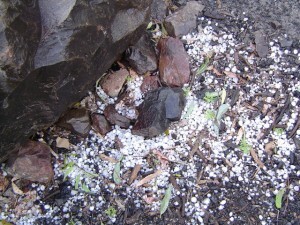 Being the hero I am, I chose to stay in the back of the truck as the hail was quite painful. We didn’t suffer any damage but just up the road Coonabaraban copped a lot of damage – we heard the hospital had to be evacuated, along with other buildings. Next stop Moree, for a few night. Truck tour – Laughers Lost in Oz from Brianna Laugher on Vimeo. 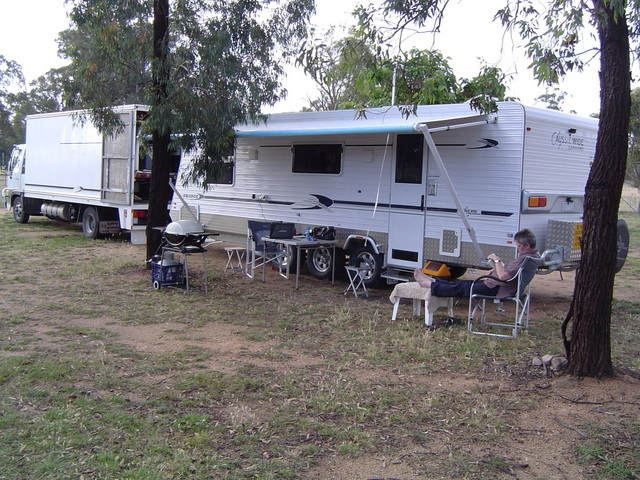 Caravan parks – Laughers Lost in Oz from Brianna Laugher on Vimeo. Vehicle setup – Laughers Lost in Oz from Brianna Laugher on Vimeo. It’s a hard life… – Laughers Lost in Oz from Brianna Laugher on Vimeo.